The truck driver: a modern nomad. The nomadic lifestyle is one of the oldest types of lifestyles in existence today, and a career as an over-the-road truck driver can be very similar. Robert Schecher embraces what this lifestyle brings. Rob started driving in 1995 for a printing company in New York, helping deliver equipment. As the years went by and the printing industry quickly fell behind the digital revolution, Rob decided to follow his dream of taking driving to the next level. After obtaining his CDL, Rob looked into which carrier would be the best fit for him. At a career fair hosted by his CDL school, Rob ran into Bruce Bento. Bruce’s forthright explanation of TransAm Trucking helped Rob decide that TransAm Trucking was where he wanted to be. In 2016, Robert joined TransAm Trucking and it is where he currently chooses to contract his business. Rob also takes part in the TransAm Trucking Mentorship program that pairs up recent CDL graduates with TransAm Mentors. He spends time with each of his mentees to familiarize them with TransAm Trucking and shares some tips along the way. Rob spoke about how his goal as a mentor was to engrain in his mentees that safety is the most important aspect about being a truck driver. When asked what advice he shares with newcomers in the industry, he said, “Take your time and plan ahead.” Robert emphasizes that being prepared and adequately performing pre-trips, post-trips, and scaling your loads can put drivers in a drastically better situation down the road. Speaking with Rob, his positive outlook is infectious. Many of his peers value Rob as a valuable resource of trucking knowledge, a good laugh, and a great friend. 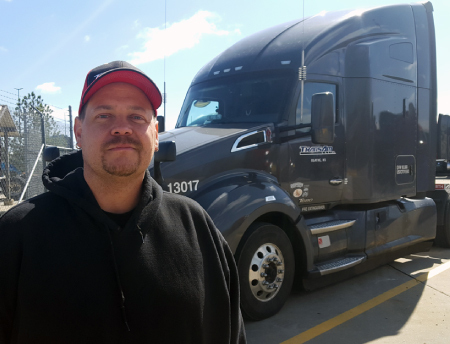 Rob is a trailblazer within the trucking community and it shows in the effort he gives to helping other drivers. Through his dedication to his business, Rob has affected countless individuals, both while over-the-road and here at TransAm. We are grateful to have such a noble driver contract his business to the TransAm Family. Thank you Rob, for everything you do!